While there are no plans for an official PlayStation VR version of Final Fantasy XIV, there are actually some pretty cool unofficial ones you can try. This week in the FFXIV subreddit, a fan named Donald Annis posted a 3D video in which he rode his mount around the Lavender Beds zone. He made the video using BigScreen, a program that maps games onto a desktop screen in VR, and TriDef 3D, a software that converts games into stereoscopic 3D. Projecting the view onto two screens, each for one eye, Annis approximated a VR experience of the game. Annis’ more true-to-form FFXIV VR video, posted yesterday, is viewable on Google Cardboard and the HTC Vive. His flying tour of the Dravanian Hinterlands showcases the game’s flair for zone design. Around the 1:20 mark, Annis switches to first-person perspective and peers down a set of stairs, which made me super dizzy when I viewed it on Cardboard. I guess that’s how I know it works? 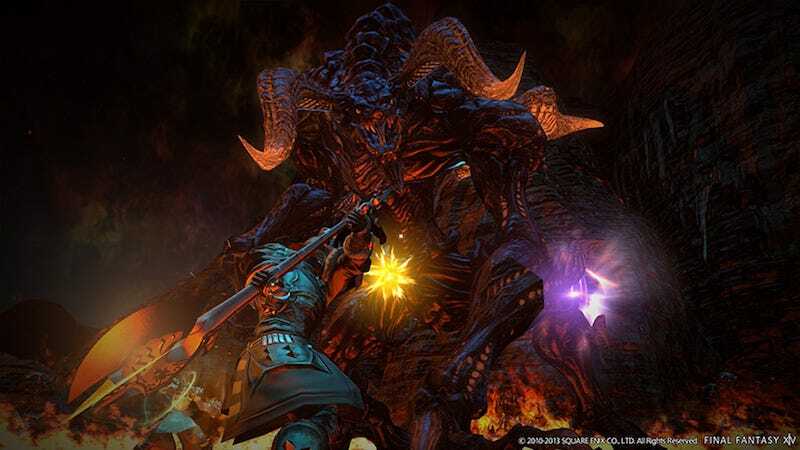 At the Tokyo Game Show 2015, a VR Demo of FFXIV proved to be a hit among attendees. Participants railed on Titan, the enormous rock Primal, whose size appeared tenfold more imposing in VR. I’m still waiting for the real thing, but in the meantime, these DIY videos are a fun diversion. CORRECTION - 11:06am: This article originally stated that an official VR version of FFXIV is in development, but as far as we know that’s not the case. Square Enix has said that the Tokyo Game Show demo of FFXIV running in VR was actually just built for that trade show. We apologize for the error.